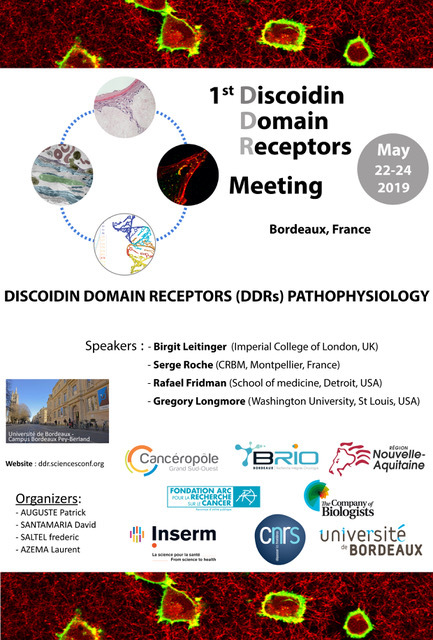 The first international conference on Discoidin Domain Receptor biology will take place in Bordeaux, on May 22-24, 2019. The Discoidin Domain Receptors DDR1 and DDR2 form a unique subfamily of receptor tyrosine kinases (RTKs). They perform pleiotropic functions in the control of cell adhesion, proliferation, survival, migration, and invasion. As a consequence they perform essential roles during embryonic development as well as in adult tissues. Yet, the signalling pathways activated by DDRs are not completely understood due to the complexity of their biology. DDRs interact with key components of the extracellular matrix and often crosstalk with different classes of cell surface receptors such as integrins and other RTKs. Furthermore, DDRs show distinct activation kinetics and can perform cellular functions that are independent of their kinase activity. This functional complexity is even further enhanced by the fact that DDR activity is modulated in a context and cell-type dependent manner. There are increasing evidences that associate aberrant DDR function with various human diseases including cancer. Moreover, pharmacological inhibition of DDRs results in significant therapeutic benefit in some pre-clinical models that recapitulate human disease. Yet, there is an urgent need to increase our current understanding of the biology and cellular functions of DDRs to translate this knowledge into better therapeutic treatments.